Cambodian Food Creamy Pineapple Soup | Homemade & Yummy Homemade & Yummy | Fun delicious recipes and more. Have you tried Cambodian food? Until now, I had never tried anything in this interesting cuisine. Creamy Pineapple Soup is my first experience making and eating a Cambodian dish. Did you know that pineapple makes great soup? Combined with chicken, lemongrass paste, chili powder, and coconut milk, you will feel like you are on vacation right in your own kitchen. This post is graciously sponsored by Angkor Cambodian Food. All opinions are mine. I don’t even think we have ANY Cambodian restaurants around me. I know for sure they do in Toronto. I love trying foods from other cultures around the world. The BEST part is, you don’t even have to leave home to taste the flavours of the world. You can buy so many of these tasty ingredients to make these delicious dishes in your own kitchen. This post will show you just how easy and delicious this cuisine is. When Angkor approached me to recreate their Authentic Creamy Pineapple Soup, I got so excited. This was going to be a fun and tasty experience. My first time working with these unique ingredients. Did I mention I LOVE my job? I had never heard of pineapple soup. In fact, I have never eaten pineapple in a soup ever! I love trying foods of the world, especially when I can make them at home. Things like pho and chana masala are such great ways to experiment with ethnic recipes. When I got this opportunity to experiment with authentic Cambodian recipes, I was thrilled. I quickly did some research into Cambodian cuisine since I knew nothing about it. I came across interesting dishes like Bai Sach Choruk, Fish Amok and Khmer Red Curry. Cambodian food is fragrant, healthy, low in fat and sugar, and fits easily into gluten-free diets. Be sure visit the Angkor recipe page for delicious Cambodian recipes you can make at home. Angkor Food has some very unique products to bring Cambodian cuisine into your home. Our collection of authentic Cambodian sauces, spices and recipes help you explore traditional Cambodian food and inspire the creation of fusion dishes. For this recipe, they sent me Lemongrass Paste and California Chili Powder. They are FANTASTIC. 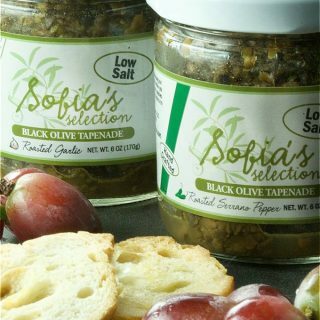 You will certainly want them in your arsenal of spices and seasonings. When I read the recipe and noticed it called for 3 tablespoons of chili powder, my first reaction was WOW this is going to be HOT. This is NOT the case. Yes, it gives your lips and tongue a little tingle, but not overpowering. What it does create is a beautiful red colour. This soup is so pretty. 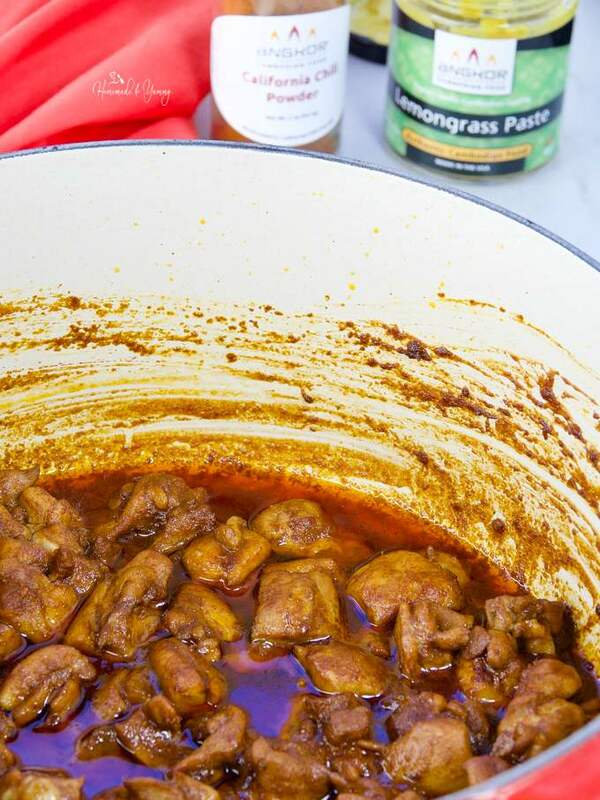 The lemongrass paste has a nice aroma and adds a nice layer of flavour. Coconut milk adds the creamy element to the dish, while the pineapple adds sweetness and balances out the kick from the chili. Basil adds freshness and ties everything together. My first experience cooking and eating delicious Cambodian cuisine was a total success. The recipe turned out fantastic. I did add a bit more chicken and kale than the original recipe called for. I wanted to make this a “full meal” dish. You can also add some rice or noodles to this very flavourful soup. Thanks so much, Angkor for helping me experience the wonderful flavours in this authentic Cambodian recipe. Cambodian Pineapple Soup is an easy one-pot dinner that you can make any night of the week. Next time you want to impress your dinner guests, serve some delicious Cambodian food made right in your kitchen. Be sure to visit Angkor Food on Facebook, Twitter and Instagram. 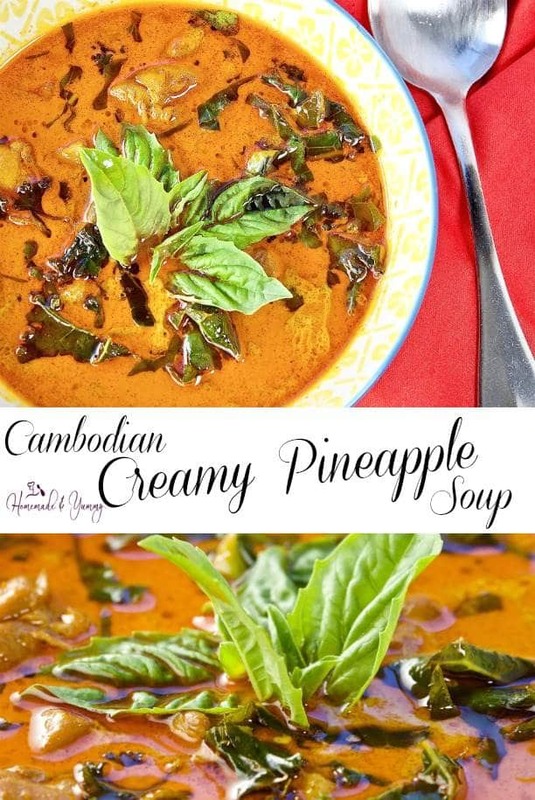 Cambodian Food Authentic Creamy Pineapple Soup is an exotic and easy to prepare dish. Beautiful red colour, sweet pineapple and a touch of heat from the chili. Cut you chicken into cubes and set aside. Cut your pineapple into cubes and set aside. In a heavy bottomed pot add the coconut oil and heat to medium high. Add the chili powder and mix. Open the coconut milk (DO NOT SHAKE), and scoop out 4 tablespoons of the thick top portion out of the can. Add to the chili and boil. Stir and cook until it becomes translucent and starts to bubble. Add the lemongrass and salt and cook until it boils. Add the chicken pieces, stir to coat well. Sauté for 5 minutes. Add 1/4 cup of water, bring to a boil, reduce and cook on medium high for approximately 8 minutes. Be sure to stir once or twice during the cooking process. Add the pineapple and the remaining water. Bring to a boil. Cook for 1 minute. Add coconut milk and bring to a soft oil. Add the kale, stir and remove from heat. This soup does call for 3 tablespoons of chili powder. While this may seem like LOTS...Angkor California Chili Powder is NOT over powering. This amount products a nice tingle but not too hot. The red colour is beautiful. You can also add some rice or noodles to this flavourful bowl of soup. When I was in Cambodia, I had CURRY for the first time EVER and it was life changing. Cambodia definitely had some amazingly tasty food! Yes we were totally impressed with this delicious soup. The flavors in this sound incredible and full of flavor! I love trying out recipes like this, and I can’t wait to enjoy a bowl of this soon! OMG…this is so good. Hope you give this recipe a try. I’m really intrigued by this soup! I don’t usually like sweet things in savory applications, but the chili powder with pineapple sounds so interesting. I do love coconut milk in basically everything though! 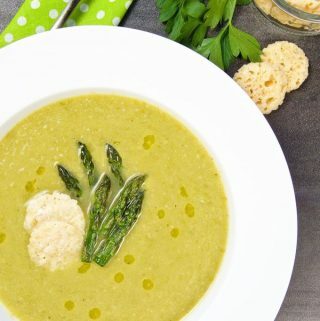 The pineapple is not overly sweet…and this soup is delicious. Hope you give it a try. This is the first time I have ever heard of pineapple soup! But looking at your recipe, it make sense that this will be a delicious combination. I would love to try this out one day. This was our first time too…and it is so good. I’ve never had Cambodian food either and I hate to say, I’m incredibly intrigued by this dish!! Pineapple in soup?? Whaaat? I’ve pinned it because I totally have to try it! Thanks for sharing the recipe! I know…that was my first thought too. It is so good. Hope you give it a try. I’ve never had Cambodian cuisine but this recipe is calling for me to try it! Those flavors sound like they really rock together and trying this may just be in my very near future! This was our first time…and we were blown away at the flavour of this soup. I did not know there was a pineapple soup! This sounds so flavorful . I’m adding to my list of new recipes to try! I know…we did not know about this either…and we are so glad we found out about it. 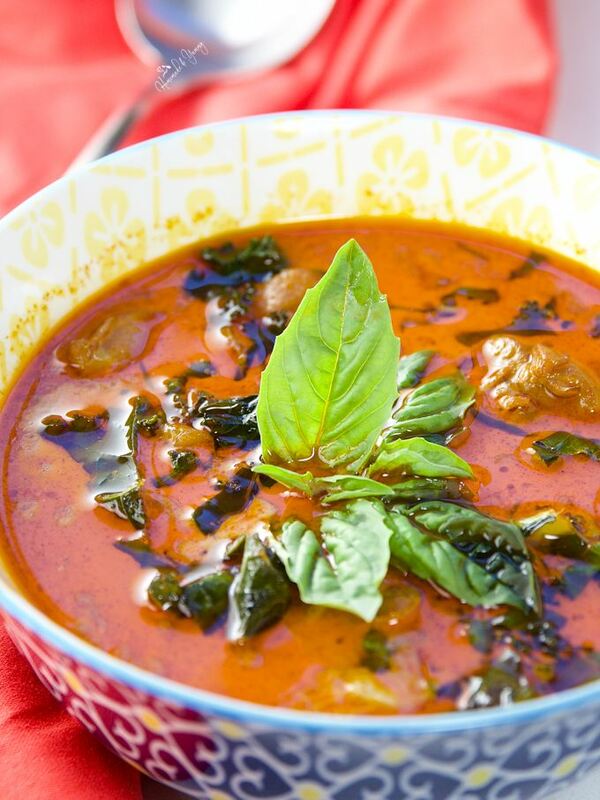 I never had Cambodian food but this soup sure looks so amazing and flavorful! Feel like having a bowl right away. 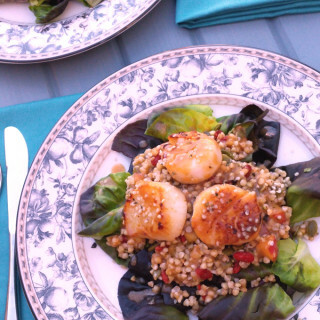 We will be making this again for sure….so delicious. Hope you give it a try. These flavors sound amazing. I can’t wait to try making this! It is good…and I sure hope you venture into the kitchen and give this recipe a try. This recipe sounds INCREDIBLE. These are the kind of flavors we love to play with in our house. I’ve never tried Cambodian food, specifically, but now I must! 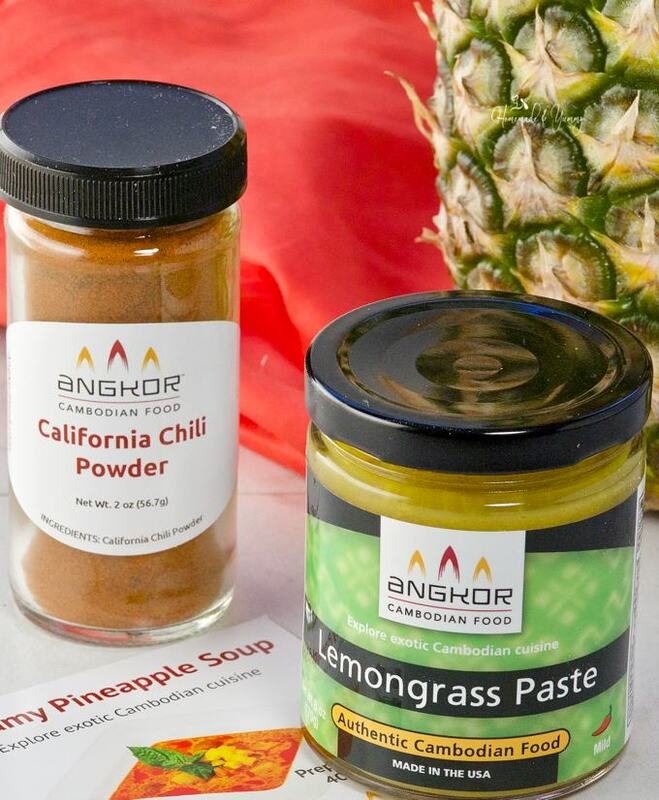 We use lemongrass paste like crazy… I can’t wait to try this brand! The lemongrass paste and chili powder are so good. Hope you give this recipe a try. Well I’ve never heard of this combo before! 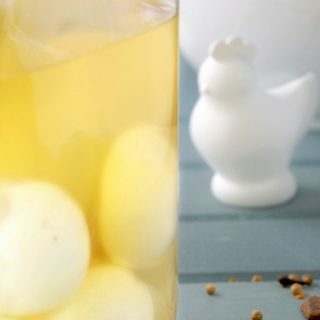 I think it looks easy and delicious…perfect for spring when some nights are still cool. This was our first time trying Cambodian food…and this soup is so delicious. I am a huge fan of Southeast Asian Cuisine and love trying out new recipes at home! I will definitely give this one a try next time I get a ripe pineapple! 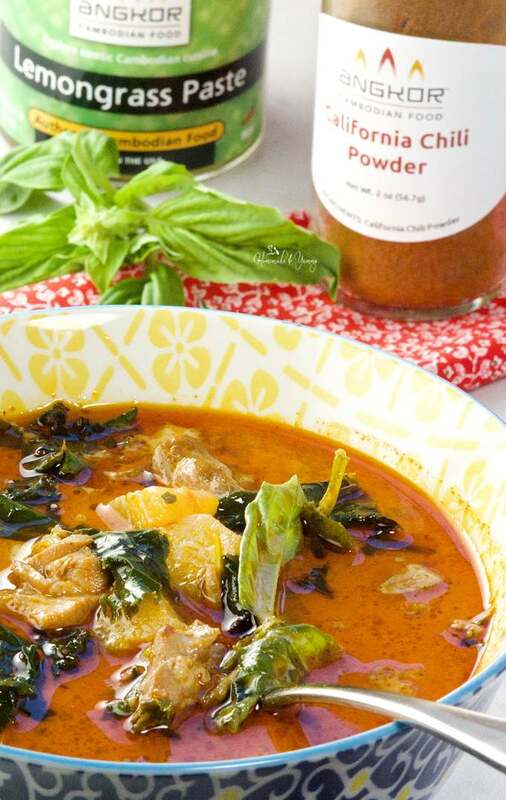 I love that you are using Thai Basil – it’s got such a neat anise-like flavour! This soup is so delicious….and it is even better the next day. I have not made Cambodian food, and this is making me want to try it! This was our first time making and tasting Cambodian food. It was so delicious. I have always wanted to visit Cambodia, but for now I’m very happy to experience it in bowl form. 😉 How fun to delve into a completely new cuisine! I just love the flavor profile of this dish. Well done! 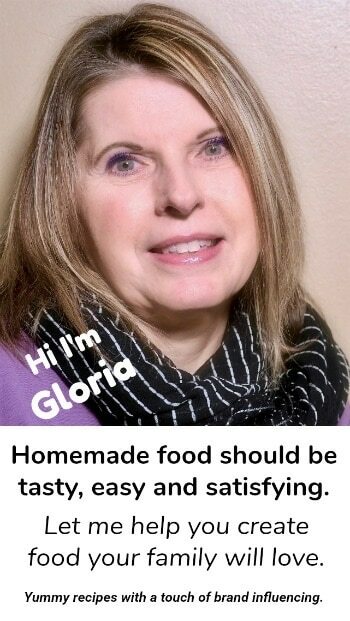 Thanks so much….it was a very interesting and tasty recipe to make. I’ve never had Cambodian food, and clearly, I have been missing out! I love all of these beautiful spices and the mix of sweet and savory in this soup. It’s such a beautiful color, too. Looking forward to trying this one! This soup is so delicious. I will be making it again for sure. I haven’t had dinner yet, and this is making me SO HUNGRY! I bet this is so good with the lemongrass and curry powder. How perfect for chilly spring nights! We were totally impressed with this delicious soup. Hope you give it a try. This looks so good! I’ve been to Cambodia and loved the food. I wish I had Cambodian restaurants near me! This was my first time trying this wonderful food. I will be making this again for sure. This soup sounds like a perfect way to wake up and please your taste buds with all the pineapple and lemongrass and the chili! 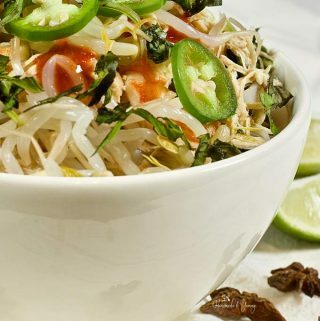 Just like you, I have never tried cambodian food before but the recipe sounds really delicious and easy! It was SOOOO good…you really need to give this a try. I was so intrigued by this I just had to make it!!! So I cooked it up on Saturday. WHAT A TREAT! The flavour is beautiful and the recipe was so easy to follow. I am SOOO happy you stopped by to let me know how it turned out. SO glad you liked it. Oh how I LOVE Cambodian food! We went there a couple of years ago with our daughters who were 4 and 18 months old at the time and totally fell in love with the culture and food and gorgeous scenery. That khmer red curry is my FAVE. I didn’t try this soup while we were there but I’m so excited to make it at home now! Well now you can give this delicious recipe a try at home. This sound so delicious and comforting. I was looking at the ingredients and it looks like it might be spicy. Is it kind of spicy? If so, I will have to save it for my husband because he loves spicy everything! You would think so…but it is not near as hot as it sounds. 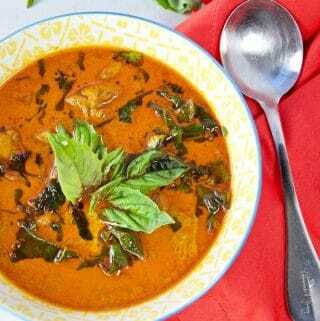 This Cambodian soup sounds yummy with pineapple, lemon grass paste, chili powder , chicken and coconut milk. I know coconut milk makes everything delicious . Lemon grass is most flavorful in curries. This really is a delicious recipe. Hope you give it a try. The recipe sounds amazing. 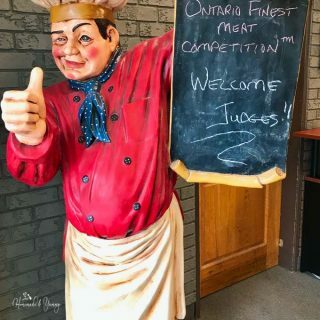 Our small town is pretty diversified but you couldn’t get Hubby to try any of them. He was stationed in the Far East and Crete and he likes many types of dishes but when I mention adding raisins to a dish or any fruit he balks. I think I’ll just do it and let him guess what’s in it. This soup is one I’d enjoy. This was our first experience with Cambodian food….and we were so impressed with the flavours of this dish. This really is different. I can’t get over that rich, red color. I’m going to have to dive into this cuisine. Saving this recipe to make this week, I think the hubster will be pleased. I know the colour is awesome…and the taste is unique and totally delicious. I know….so many wonderful flavours in the unique and delicious dish. I love the sound of this, the colors, the flavors and possibilities. I only ever had Cambodian food once and I think I will enjoy this one. Saving this for later. Can’t wait to try this. This was my first time making or eating Cambodian….it was so good. 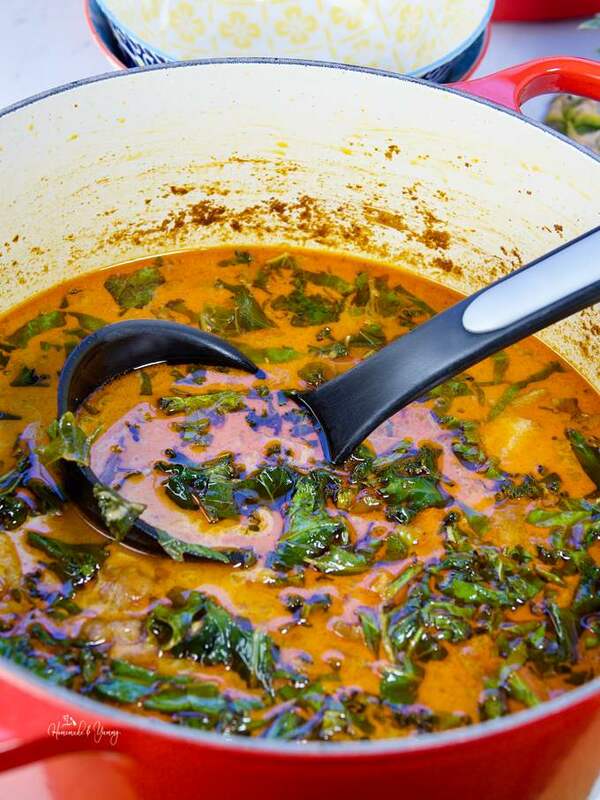 I’ve never tried Cambodian food and you are tempting me to give this soup a try real soon. It sounds so flavorful with all the aromatics and spices. Soup looks hearty and delicious. It was even better the next day. I just picked up a jar of lemongrass paste the other day out of the blue and didn’t know what to use it for. This soup was perfect! Thank you so much for sharing the recipe with us! Enjoy…where did you get it from? I know you are in Canada…I have only seen it in a tube? Pineapple soup?! You have blown my mind! 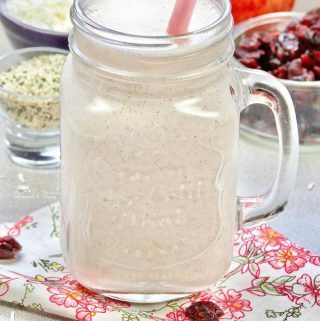 What a delicious idea with all the spices and flavors in this! I would love to try this out! 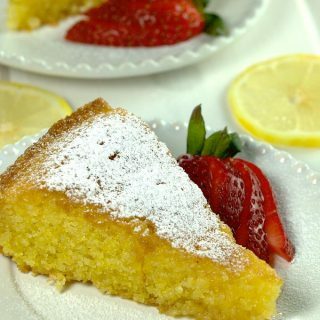 I know for sure I will be making this again….it is soooooo good. I’m blown away by this recipe, it uses some of my favorite flavor combinations, pineapple, coconut, basil, lemongrass, and chili. This dish sounds very flavorful with a bowl of steamed rice. Sounds similar to Thai cooking. We were so impressed with our first experience with Cambodian food. Yes….you can find just about anything in Toronto. This was my first experience….and it was so good. I have never had Cambodian food, but I’d defiintely like to try it! I’m intrigued by the pineapple in the soup. And I need to order some of that lemongrass paste! I can never find lemongrass, but love the flavor! These products are so good. Hope you give them a try. Wow that sounds so good! I have never had Cambodian food either but I adore lemongrass and spicy foods. I have never heard of lemongrass paste. I love the taste but never want to buy the stalks. It’s funny because just the other day I was shopping with my sister in an Asian grocery store and picked up a stalk of lemongrass and we both wanted it but didn’t want the hassle of the stalk. I’m going to go pass this recipe on to her too. She’s going to love it! And my husband will adore this soup recipe. 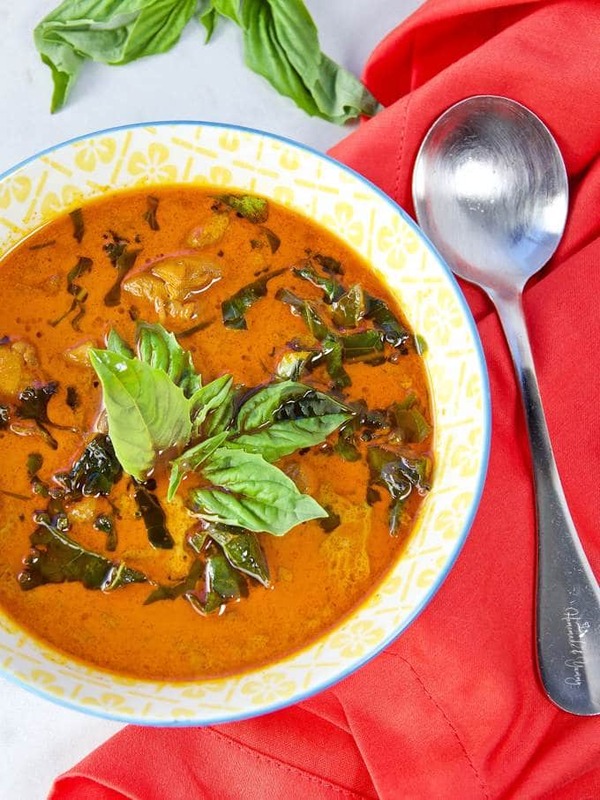 We both love coconut milk and spice in our soups. I was so impressed with this soup. And…it is even better a day or two later. This was my first experience with Cambodian food….and it was so delicious. Will be making this again for sure. Oh my word…I love everything about this recipe, starting with the fact that you used chicken thighs. I swear by those when I’m making anything that needs longer cooking time. They just hold up so well! And I love the pineapple curry flavor combo. 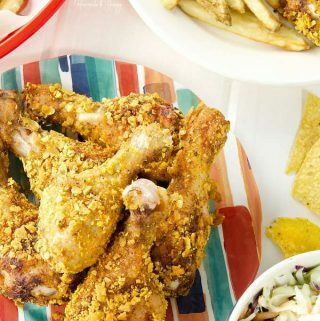 I’m pinning this for later…can’t wait to make it! 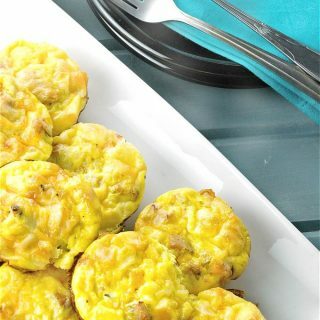 Hope you give it a try….it is a delicious recipe for sure. I could just dive right into a bowl of this soup! Such a diverse group of ingredients, but obviously they marry well. Lovely. Yes the flavours are amazing…and it is so easy to make. Wow what a delicious sounding soup, I love finding things I’ve never tried before! So much fun in the kitchen making new things. This soup sounds so interesting flavor-wise! I never heard of pineapple soup, but it looks so delicious I have to try it! This was my first time making pineapple soup…and it is so easy and delicious.